Keep the front seats in your '98-'02 Dodge Ram truck looking new or cover up damaged seats with the addition of slip-on Covercraft seat covers. They protect against dirt and outdoor sun to help keep the seats looking like new. 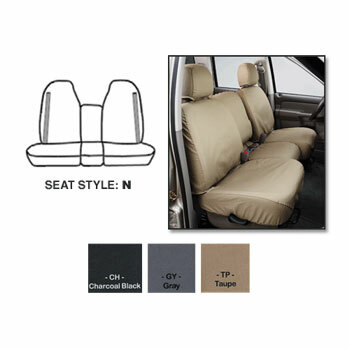 The seat covers are made with a breathable heavy-duty polycotton fabric so they are comfortable and you won't stick to them like other kinds of seat covers. We find the fabric to be slightly lighter than blue jeans, but heavier than polyester/wool. The fabric is protected with a DWR (durable water repellency) finish that prevents most spills from reaching the seats. It is suggested that you respray the seat covers with a DWR product after five or six washings. The folks at Covercraft make the best fitting seat covers that we could find. You'll like the the washable fabric that has proven to be curable, yet not too bulky. We don"t mind the Lab's getting in as much now. "I love opening a package from Geno's Garage. Never know what kind of goodies they are going to send with your order! Thanks, Geno's!"